Smoochum in game: 2,568 Who? Important notice! Pokemon Smoochum is a fictional character of humans. 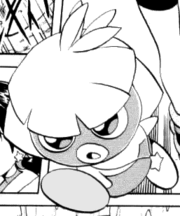 Smoochum (Japanese: ムチュール Muchul) is a dual-type Ice/Psychic baby Pokémon introduced in Generation II. It evolves into Jynx starting at level 30. 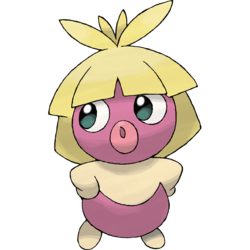 Smoochum is a small, humanoid Pokémon that resembles a baby. It has a large head with blonde hair that reaches its shoulders and has large bangs. There are several tufts of hair sticking up on top of its head. Its skin is light purple with a cream-colored chest, arms and feet. It has large, blue-green eyes and a pair of large, pink lips. These lips are sensitive enough that Smoochum uses them to identify and examine objects that it sees for the first time. When walking, Smoochum rocks its head back and forth. This Pokémon is very active and runs about, although it often falls. Being very conscious of its appearance, it will check is reflection when given the chance to make sure it is not dirty. Smoochum is found living in cities. Smoochum is a female only species, with no male counterpart. In The Screen Actor's Guilt, Brad Van Darn had a Smoochum. Brad's agent is afraid that Brad would have his image as an action star ruined if they found out that he owned a Smoochum. A Smoochum nicknamed Josephine was used by an unnamed female Trainer in One Trick Phony! who battled Pikachu. A Smoochum is one of the best friends of the Pichu Brothers. Smoochum first appeared in Pikachu and Pichu, and has made further appearances in Trouble in Big Town, Of Meowth and Pokémon, Big Meowth, Little Dreams, Pichu Bros. in Party Panic and made a brief cameo appearance in Giratina and the Sky Warrior. Another Smoochum was in Three Jynx and a Baby. She got herself separated from a trio of Jynx sisters and stumbled upon Team Rocket. Jessie had plans on using Smoochum's cuteness for profit, but her plans were foiled by the three Jynx Sisters and Ash and his friends. Jessie temporarily trained a Smoochum in Camping It Up!. A Smoochum appeared under the ownership of Normajean in The Brockster Is In!. A Smoochum appeared in Pathways to Performance Partnering!, under the ownership of a Pokémon Performer named Nini. This same Smoochum reappears in A Performance Pop Quiz!, A Dancing Debut!, and Master Class Is in Session!. A Smoochum appeared in Pikachu and the Pokémon Music Squad. A Smoochum was used by one of the students of the Pokémon Trainer's School in Gonna Rule The School!. A Smoochum under the ownership of a Coordinator appeared in Dawn's Early Night!. It was used along with a Steelix for the Double Performance required during the Hearthome Contest. Another one appeared in the Sandalstraw Contest in Old Rivals, New Tricks!. Smoochum also appeared in Sliding Into Seventh!. EP203 Smoochum Ash's Pokédex Smoochum, the Kiss Pokémon. The pre-evolved form of Jynx. 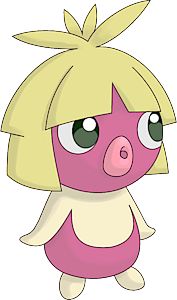 This sweet natured Pokémon has sensitive lips, which it uses to explore and examine with. XY050 Smoochum Serena's Pokédex Smoochum, the Kiss Pokémon. Smoochum's lips are quite sensitive, so it uses them first to investigate objects. 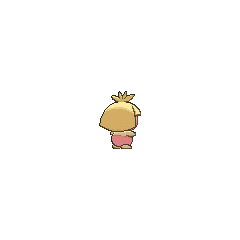 Jynx, the fortune-teller, has a younger sister, a Smoochum. Smoochum has not learned to tell fortunes yet, but she pretends to anyways, fooling Hazel, Coconut and Apricot by telling them bad fortunes in What Makes A Girl?. A Smoochum is one of the baby Pokémon that escape the Daycare Center near Goldenrod City in Gligar Glide. Crystal has a Smoochum, named Chumee which it first appeared in Slugging It Out With Slugma, as part of her capture team, using Mean Look to trap targets for capture. She took a break when Crystal let Chikorita join the team. In The Last Battle XIII a Smoochum was one of the Pokémon sent to help the fight in Ilex Forest. One Smoochum figure has been released. It always rocks its head slowly backwards and forwards as if it is trying to kiss someone. It actively runs about, but also falls often. Whenever it falls, it will check its reflection on a lake's surface to make sure its face hasn't become dirty. Moves marked with a superscript game abbreviation can only be bred onto Smoochum in that game. 51%-100% HP I can tell if you're weak or strong--all it takes is just a little kiss! 26%-50% HP Uh-oh? I think I lost about half my HP so far. Level up Yay! I leveled up! Kiss me to see how strong I am? It composes hearts around itself that make Pokémon Tired. Smoochum have traveled to the Iceberg Zone to see the Ice Tree! They enjoy taking Photos and playing Skill Games. 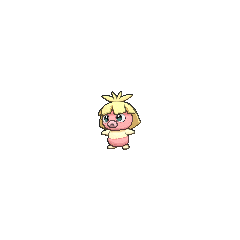 For other sprites and images, please see Smoochum images on the Bulbagarden Archives. Although classified as pink in the Pokédex, it has been depicted as purple on several occasions, including the Pokémon mini console modeled after it. In Pokémon Gold and Silver, Smoochum is programmed to be able to learn Lovely Kiss through breeding, but no male Pokémon in the Human-Like Group can legitimately learn it to pass down as an Egg Move in those games. 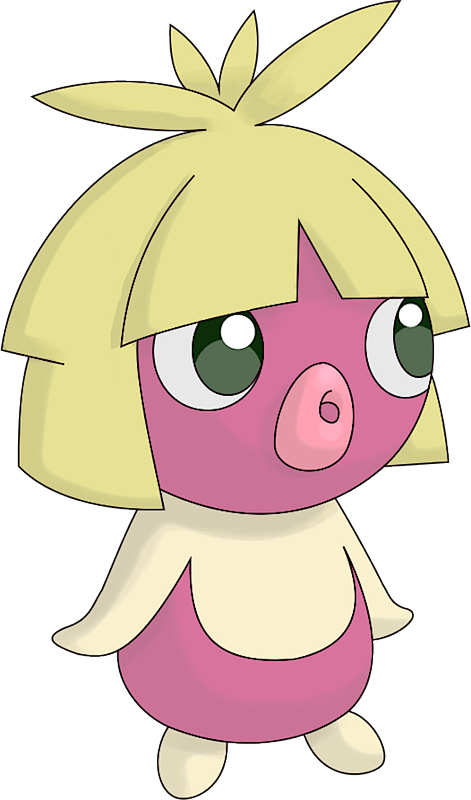 In Generation VI, Jynx would have been able to pass down the move due to changes in breeding mechanics allowing mothers to pass down Egg Moves. Smoochum may be based on ガン黒 ganguro, blonde-haired, tanned Japanese girls, but is meant to resemble an otherwise normal human child. Yuki Onna, a possible origin for Jynx, is sometimes shown as holding a seemingly human child. 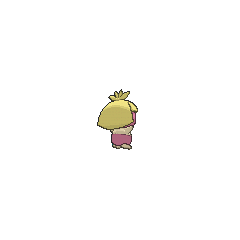 Smoochum could also be based on the legend of Kintarō, a human child raised by the Yama Uba, another possible origin of Jynx. Smoochum is derived from smooch (a kiss). It also may be a combination of smooch and chum (friend). It may also be a pun on "smooch 'em." Muchul is a combination of 夢中 muchū (daze or trance) and ちゅう chu (the sound of a kiss). Mandarin Chinese 迷唇娃 Míchúnwá Literally "Bewildering lip doll"